RALEIGH — The lawsuit over a power struggle between Democratic Gov. Roy Cooper and the Republican-led General Assembly turned into a legal quarrel at a Tuesday hearing, with one of the three judges assigned to the case repeatedly peppering defense attorneys about timing. 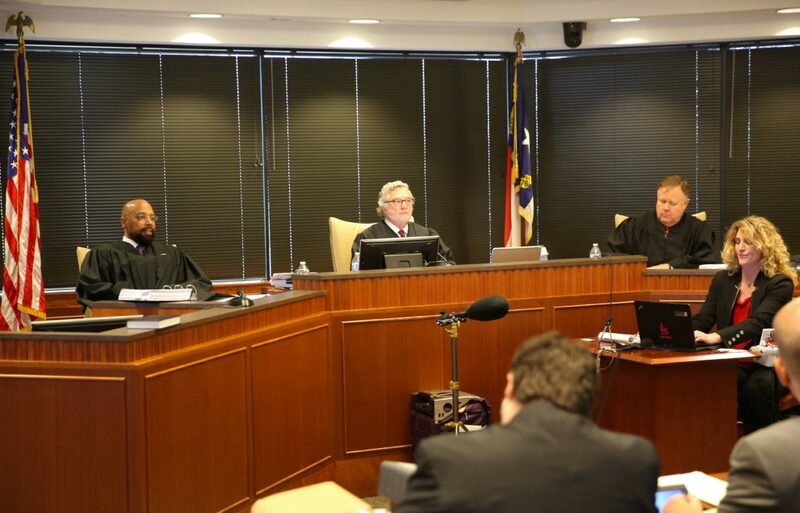 The three Superior Court judges — Jesse Caldwell of Gaston County, Todd Burke of Forsyth County, and Jeffery Foster of Pitt County — heard arguments at the Campbell University School of Law. The dispute centered around whether any of three provisions within laws passed by the General Assembly during a mid-December special session violated the separation-of-powers doctrine in the N.C. Constitution, limiting Cooper’s ability to execute the laws. One provision combined the State Board of Elections and State Ethics Commission into one board. Another required Senate confirmation of the governor’s Cabinet appointees. A third reduced the number of political appointments the governor could have from 1,500 to 425. “I’m questioning the intent of the legislature,” Caldwell said, noting that in other instances judges can question intent, such as disputes over racial profiling, the removal of potential jurors for racial reasons, or legislative redistricting cases. Judges are allowed to consider the legislature’s intent to see if lawmakers acted under the pretext of restricting the governor’s legitimate power. “Respectfully, your honor, on a facial challenge, I don’t think there is a question of pretext,” responded attorney Martin Warf, who represented state lawmakers. Warf said any time the General Assembly changes a law affecting the authority of a governor, the governor would be likely to challenge its legality. During his closing statement, lead attorney Noah Huffstetler acknowledged that there are areas in constitutional law where the court can look at motives, such as racial profiling. Jim Phillips, Cooper’s lead attorney in the lawsuit, argued that the provision combining the functions of the two boards hindered Cooper’s ability to execute the laws, partially because of the way the new board would be appointed. The new board would have eight members, four Democrats and four Republicans. The governor would appoint four members, with the other four appointed by legislative leaders. The governor could remove only the board members he appointed. Only legislative leaders could remove the board members they appointed. Phillips likened Cooper’s lawsuit to one McCrory won against the General Assembly when he challenged legislative appointments to certain environmental boards. The governor’s ability to execute the laws depends in part on his ability to appoint, supervise, and remove board members, Phillips said. Without those powers, the governor’s authority is hindered, he said. Huffstetler countered that the State Board of Elections, unlike other executive department division, was set up as an independent agency and isn’t supervised by the governor. “The governor never had the power to direct the State Board of Elections on a day-to-day basis as to how it carried out its day-to-day operations and its decisions,” Huffstetler said. Phillips asserted that a constitutional provision giving the state Senate “advice and consent” powers wasn’t intended to apply to his Cabinet officials. Phillips said the governor’s Cabinet appointees were his “alter ego” and that having advice and consent from the Senate would not always allow the governor to choose the person he wants. Warf also said that acts of the legislature are presumed to be constitutional unless they can be shown beyond a reasonable doubt to violate the constitution. Eric David, one of Cooper’s attorneys, took issue with a provision in the law reducing the number of political appointees the governor can select. That provision allowed some of McCrory’s political appointees to assume career employee status and gain civil service protections, preventing them from being replaced at Cooper’s discretion. He said there are at least 124 state employees loyal to McCrory who were granted career status. Candace Friel, another attorney for the legislature, said that while the General Assembly passed the law allowing such employees to assume career status, the former governor placed those individuals in their current positions. After Tuesday’s hearing concluded, Caldwell said the three-judge panel would deliberate and come to a decision. He did not say when it would come down. “You’ll know something when we know something,” Caldwell said.